This type of slot machine pays depending on the winning combination that is listed on the schedule. For instance, you can get two coins for every cherry that you put in, then you can get five coins for two cherries, and you will get ten coins for three cherries, and so on. As the name implies, this type of slot machine game will multiply the payout depending on the amount of coins you have played for a particular game. One example is when you play three cherries for one coin; the machine will pay you five coins. For the second coin that you play, you will be paid ten. And for the third coin you play, you can get paid a total of fifteen coins. There is no advantage whenever you play maximum coins. This game is a bit similar to the multiplier type of slot machine but with a slight variation. You will get a bonus whenever you play maximum coins. Whenever you play an extra coin, it will double (or more) the amount of winnings you can take home from that slot machine, especially when playing a two-coin machine. 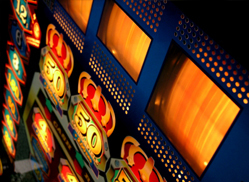 If you play in a three-coin machine, you can have the opportunity to triple your winnings. It pays to read the machine before playing to get a full grasp about how this game works. This type of game is unique as the number of lines that can be played will depend on the amount of coins you play. When you deposit only a single coin, you will get to play the middle line. Whenever there is a hit on any of the other lines that you did not play in, you will not take home the winnings. When you play two coins, you can play the top line but if you add a third coin into the machine, then the bottom line will be included in the play. You can now get a higher opportunity for winning since all three horizontal lines are put into play. You need to remember that the number of winning rows you have on the slot machine does not impact your odds for winning. The only benefit it will give you is the increasing of coins number in play.